Home » 2016 Election » What Makes Tuesday So Super? What Makes Tuesday So Super? We’re adding an interactive map feature at Wolves and Sheep courtesy of our in-house graphics designer Sharon Machlis. During the election season, Sharon will be providing visual representations of abstract concepts to accompany our narrative understanding of events. The two maps below portray the states in play on Tuesday March 1 for the Democrats and Republicans. Clicking on the states tells you how many delegates are up for grabs. The darker states award more delegates. Two things jump out: Super Tuesday is the day the campaigns pivot from the retail politics of Iowa and New Hampshire to the wholesale politics that will characterize the balance of the primary race; and while it is billed as a national primary day, most of the action is in the South. In fact, within two weeks of Super Tuesday the entire South will have voted, making it the first region to weigh in and offering a tremendous momentum advantage to candidates with strength there. If Saturday’s South Carolina results are any indication – and they are – Hillary Clinton stands to accumulate a significant delegate advantage in primaries across the deep South, driven by her strength among African American voters. Bernie Sanders will look to be competitive in the northern tier of states, notably Massachusetts, Minnesota, Colorado and his native Vermont (where we could declare him the winner today). His challenge will be to win these states while holding Clinton’s overall delegate advantage to a manageable number. On the Republican side, Super Tuesday’s Southern tilt would be expected to give a boost to Ted Cruz, but if Donald Trump continues to cut into Cruz’ evangelical support like he did in South Carolina, Cruz is going to have difficulty winning outside his home state of Texas. But Texas is the big prize on Tuesday with 155 delegates at stake, and Cruz can balance some of his expected losses elsewhere with a win. With Trump drawing support across ideological groups, he is poised to compete everywhere, and Super Tuesday will be a big test of his claim to be a candidate with nationwide appeal. Marco Rubio’s big opportunity and greatest challenge will come on March 15 when Florida votes. John Kaisch is holding out for a win in his home state of Ohio on the same day. It’s not at all clear what Ben Carson is doing. As of today, a lofty four percent of the available delegates have been allocated. After Super Tuesday, that figure leaps to 30%, the largest one-day jump of a primary campaign that will continue through June. The figure below shows the cumulative percentage of delegates awarded as we move from winter to spring. 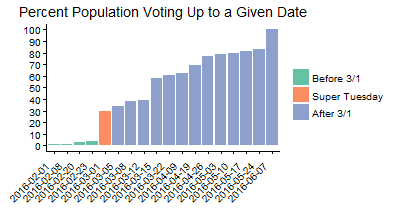 So while the media will no doubt spin narratives about how Super Tuesday produced inevitable nominees, and without question the momentum boost for a big Super Tuesday winner would be real, let’s not forget that fully 70% of the delegates will remain unallocated after Tuesday’s balloting and most large states will still be waiting in the wings. California – the largest state – votes last. Please don’t ask me to explain why.